Which Highway 11 town has 9000 people, more than 50 shops and services and was the hometown of the director of movies like Terminator, Aliens, True Lies, Titanic and Avatar? Yep, Kapuskasing is kindofabigdeal in Highway 11 terms. Kap has some neat sites. The old Ontario Northland train station has been recently fixed up and has a little area for art exhibitions from the area. There’s an old locomotive adjacent to the station that houses train memorabilia and neat facts about the CNR’s history. 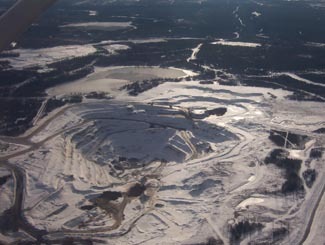 Originally named Macpherson, the ‘model town of the North’ was built around the pulp mill that originally supplied paper to the New York Times. When they built the mill, they decided to build a company town, and since it was a company town they planned it as the ‘model town of the north’ complete with planned parks (quite nice), its own power supply (which used to serve the town and mill exclusively), and an English-style traffic circle, which residents and visitors alike find confusing to this day. t were interred near Kap during the First World War (the photo of the guy with the hat.) Further in off the highway there’s one for German/Austrian/Turkish Prisoners Of War (the photo with the little crosses) that died while being imprisoned. Kapuskasing was perfect because at the time the only way in and out of town, at that time, was by train. In other words, everyone detained there was stuck – there was no way to escape and nowhere to go if you did. 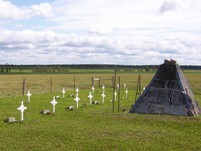 They used their labour to clear land for Kapuskasing’s experimental farm, which is right beside the 24 graves of the POWs. ”Off again – on again – gone again” (Signed) FLANIGAN. 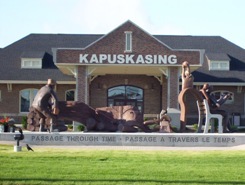 Like all the francophone towns (it’s about 30/70 anglo/franco) of the north, Kapuskasing is really quite nice. Although a James Bay tourism brochure bogusly claims that Kap is a town of “street dances” (who wrote that thing? ), there is a fair amount to do for a city of its size. There is a farmer’s market in the summer. If you can make it past the downtown traffic circle in the direction of your desire, you’ll find a really nice lakefront park and some good walking paths. Pub Max, right on Highway 11, also has good food, especially the chicken salad sandwich. There are two touristy stores on Highway 11 in Kap, namely Marbleworks and the Moonbeam Country Store. This entry was posted in The Interior and tagged amenities, farm town, francophone, hydro, military, pulp and paper by Highway11.ca Editor. Bookmark the permalink. Kap is the best city I’ve ever lived in! Honesty is completely wrong about the french and english, its about 50/50 in town. I lived there for over 6 years and never had problems with any of the english or french people, not like hearst, that’s a town that you have to be french to live in! Its a great town all around, if you like small towns this is the place for you!! I’d recommend moving to kap unless you want to work at the mill. 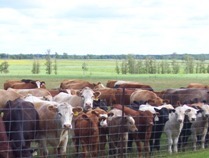 Lot’s of great hunting and fishing to be done up in Kapuskasing…also Moonbeam. Just read Les Patchin’s comment. I grew up in Kap and left after graduating KDHS in 1972. I remember Les from grade one. My father taught at Diamond Jubilee. Kap was a great hometown and those were the Golden Years. I returned, with a friend, this past July, after an absence of 39 years. Was sad to see how many of the buildings had deteriorated. Park looked great, though. Did we ever do a skating rink thing once at diamond jubilee? I live down here in cabo san lucas mexico! I think we spilled the thing we were carrying and went back to pick it up! Correct me if I am wrong! That is a long time ago…no more cold for me, I now live in cabo San Lucas Mexico……it is perfect! I make it to Kap sledding 6 or 8 times a year. I most always bring a friend or a group of friends. I have never had a bad experience in Kap, and everyone has been wonderful to me. I barely speak a word of French, and it’s never been a problem. See you soon! I’ve bought my last 2 sleds from Luc at Dallaire! As for Kapuskasing, I wouldn’t recommend anyone to move here, from what I have experienced people don’t accept you if your not French and if you don’t even sound Canadian its worse! I’m tired of always being asked where i’m from with a sarcastic tone to only find out I’m Canadian born and raised and they drop their mouths. People need not to judge like a book and here I find it bad. I have a huge heart. If your driving and don’t speak french keep trucking on. But if you do, go in and say HI to PHIL in Esso hes great and always has a SMILE!! !